SRINAGAR, Jan 22: One of the founders of Peoples Democratic Party (PDP) and former parliament member Tariq Hamid Karra on Tuesday slammed the PDP President and former Chief Minister Mehbooba Mufti over the justifications being given by her at present for forming the government with BJP after her father’s demise in 2016. Mehbooba on January 7, this year, while addressing a commemoration ceremony of third death anniversary of PDP founder Mufti Mohammad Sayeed at Bejbehara, held few of her party leaders responsible for compelling her to form the coalition with the BJP after Mufti’s demise. However, Karra in an exclusive chat with the Kashmir Despatch ridiculed Mehbooba over the reasons she has been “dishing out” for joining the BJP. Karra accused the PDP president of contradicting her own self. “She (Mehbooba) is contradicting her own self when today she says she was coerced to join the BJP by her own party men. You must recall the statements she gave in Delhi as well as in Srinagar when she formed the government with the BJP in April 2016,”said Karra. 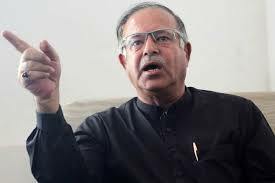 Karra, the former Parliament member from Srinagar defeated NC patriarch Dr Faroooq on PDP’s ticket during 2014 Lok Sahha polls and bid adieu to his party PDP in 2016, citing party’s decision to form coalition government with “communal” BJP as one of the prime reasons. Other reasons given by Karra at the time of his resignation was the elevation of some PDP leaders within the party ranks. He even termed the PDP at that time a hub of political novices, paratroopers and thieves of the funeral cloth. “I had predicted downfall of the PDP in 2016. Now, its doom has come and its’ heydays are gone forever. The party is at present on the ventilator and anytime the people at the helm could pullout the plug and kill it. At least for now, those at the helm are allowing it to breathe,” Karra told Kashmir Despatch and added that the leaders against whom he had upped ante way back in 2016 have destroyed the PDP brick by brick. According to him, PDP hasn’t replied to his 18 questions he had asked the party while tendering his resignation in 2016. “Perhaps time for me to ask more questions has come. I am going make more skeletons to tumble out of the closets of the PDP soon,” Karra said.